Landlords in Prime Central London (PCL) have reason to be positive this year, reports London Central Portfolio, Specialist Funds and Asset Manager, as weekly rents have finally nudged up by 4% overall to reach an average of £1.05 per square foot whilst void periods fell by 25%. Although the most internationally favoured areas have come out on top again, in terms of highest weekly rents paid per square foot, Knightsbridge, last year’s most expensive area, actually saw the largest fall in rents (11% to £1.22) losing first place to Mayfair and St James, which clocked up an average of £1.31. New research, conducted by LCP on their fund portfolios,shows that tenant priorities are also shifting. The trophy status of living in the most globally renowned areas is being trumped by traditionally less well known areas with buzzy atmospheres and convenient transport links to the City, Canary Wharf and Heathrow. Rents in Knightsbridge and Mayfair are falling, whilst the increasingly fashionable Marylebone remains the most popular location amongst London’s tenants, showing a 23% growth in rents to £1.13. Marylebone is now the third most expensive area, joining the prestigious £1.00 High Club where weekly rents stand at over £1.00 per square foot. 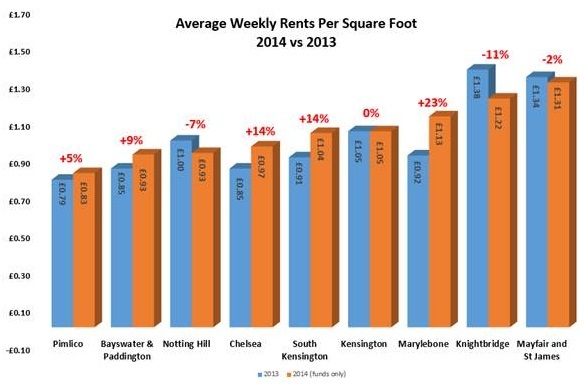 Also joining the Club for the first time was South Kensington, following a 14% increase in average rents. Notting Hill, however, has been relegated with weekly rents falling to 93p per square foot. Rental upturns were also witnessed for Pimlico (5%) and Bayswater & Paddington (9%). “For the last few years, rents in less traditional areas have lagged behind the rapid increase in sales values which have been witnessed as the centre of gravity in PCL moves to locations around main transport links, but with plenty of architectural heritage. As gentrification continues, the smart buy-to-let investor will look away from PCL’s trophy locations to the areas with more pzazz, where there is still room for rents to increase. Our fourth Central London Property Fund recognises this and whilst acquiring, as always, a portfolio of properties in all the prime postcodes surrounding Hyde Park, we will focus our attention on these up and coming areas” comments Naomi Heaton, CEO of London Central Portfolio. 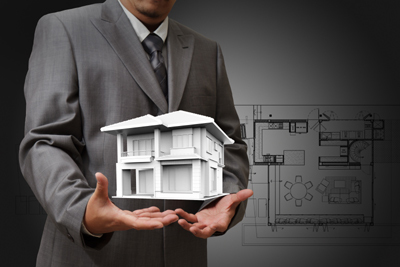 As a whole, one and two bedroom units remain the hardest working and most resilient sector of the market. 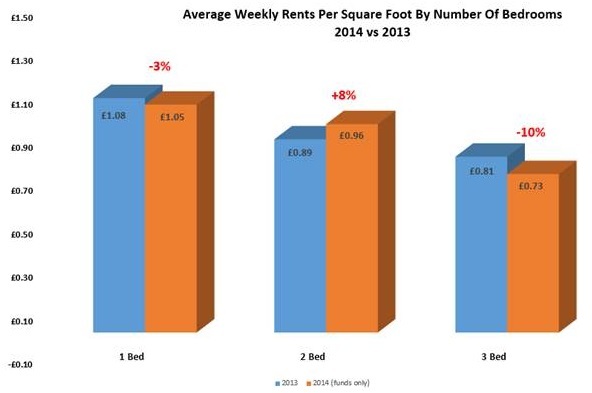 On average, one bedroom units continue to achieve the highest average weekly rents per square foot, £1.05 this year, although this has seen a slight fall of 3% from 2013. On the other hand, as the dynamic of “location over size” seen during the financial constraints of the credit crunch eases, two bedroom flats are making up lost growth with an 8% increase in rents to 96p. However, three bedroom flats, which rarely see a return for the extra square footage, are continuing to lag behind. “As the financial sector strengthens and economic sentiment picks up, two bedroom properties are coming back onto the radar as tenant accommodation budgets start to increase. LCP’s funds have always targeted small units which appeal most to the mainstream private rented sector, cherry-picking the best 1 and 2 bedroomed properties with maximum upside potential. Whilst our last fund was biased towards one bedroomed units, the steady-eddy of the rental market in the aftermath of the credit crunch, our fourth fund, London Central Apartments II, will be taking a keen interest in two bedroomed units as they gain popularity once again” concludes Heaton.